Nessco Pressure Systems (NPS) are pleased to announce they have been nominated as a finalist in the 10th Fremantle Business Awards. 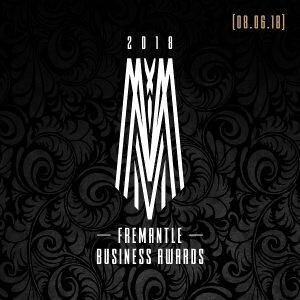 The awards recognise small, medium and large businesses, and the impact they have on the Fremantle community. NPS has been nominated in the Excellence in Professional Services category. This category highlights those who provide professional services and build their organisation around the needs of their target market. “It’s our aim to always meet our clients’ compressed air needs on time and within the budget they specify. We’ve had great success in the past year, in particular with local legends D’Orsogna, who we worked with to design a compressed air system for their meat processing plant” added Mr West. NPS helped D’Orsogna to provide a reliable and energy efficient compressed air system that provides the required flow and pressure the factory needs while also ensuring the correct quality grade of air for the products is delivered. The winners of each category will be announced at the awards dinner held at the Esplanade Hotel in Fremantle on June 8th. “It should be a great night. We’re planning on taking the whole team to celebrate our success and fingers crossed we take home the prize” said Mr West. Are the potential dangers of air receivers just a bit of hot air? When comparing electricity or gas compressed air and air receiver systems, you’d be forgiven for thinking that compressed air presents very little danger. However, the reality is that compressed air brings its own set of serious issues to deal with. Air receiver tanks, in particular, present a lot of potential danger when not regularly serviced. While receivers are classified as having non-hazardous gas content, they present serious risks due to the pressure built up as stored energy within the vessel. With regular servicing and inspections carried out on vessels and associated safety valves in compliance with Worksafe requirements, the likelihood that a problem will occur is greatly reduced, therefore reducing the risk to you and those working near a receiver. There are several common problems that air receivers may suffer from. Vibration can create cracks in the welds attaching a compressor system to the air receiver or the welded base below the air receiver. Damage can also occur when rigid piping is connected to the air receiver without allowing for an amount of vibration. If your 2-tonne receiver breaks off and falls on someone close by, it could result in serious injury or even death. External damage to the air receiver can also be caused by vehicles, objects or machinery coming into contact with the vessel. Without any proper barrier separating the unit from these external dangers, the chance of an accident is increased. Internal corrosion is another problem area that can affect receivers. If condensate is allowed to collect, its volume decreases which can lead to increased cycling by your air compressor. The condensate can also potentially carry over to the air distribution lines, resulting in problems with air powered tools. The most detrimental effect of the condensate is internal corrosion of the air receiver. Since it’s internal, the corrosion is likely never seen by the owner and the effects are usually ignored. What are the risks of a compromised air receiver? As mentioned, the results of a damaged or faulty receiver can be potentially fatal. One such example can be seen in a report from the Australian Transport Safety Bureau. In an incident aboard a foreign vessel in Australian waters, an air receiver exploded due to a build-up in pressure, killing a nearby engineer. The ensuing investigation found that a poor standard of procedure resulted in the incorrect maintenance of the receiver. Of course, not all breakdowns result in injury or fatality but they do have their own consequences. A broken machine could be potentially down for days depending on service technician availability. Depending on the size of your operation, this could cost you up to thousands in potential earnings. If you have to replace the receiver, you’re likely to face an even longer shutdown period. This is why it’s so vital to ensure you’re on top of receiver inspections. As we’ve pointed out, it’s extremely important that your receiver is registered and you have a set inspection schedule. During an inspection, a technician will conduct a thorough assessment of the receiver and its parts, and offer solutions or recommendations if necessary. At NPS, we have a fully capable team of technicians who during the inspection will check leaks, inspect for receiver mountings and generate an external condition report. View the complete checklist of an NPS air receiver inspection or register your interest today. Let’s face it. At some point, no matter how high quality the product is, equipment or machinery will break down. Breakdowns can have major impacts on the efficiency of your production which in a worst-case scenario, can cost your business thousands of dollars. While breakdowns are inevitable, regular and professional air compressor maintenance assures the reliability and quality of your equipment. So why should I invest in maintenance? With regular maintenance, you lower the risk of your compressed air system breaking down which ultimately leads to lower profitability. Think of your air system like a car being serviced. Filters and fluids are replaced, cooling water is inspected, belts are adjusted, and leaks are identified and repaired. These regular checkups ensure your compressed air system remains reliable throughout its lifetime. Without servicing, system integrity could be compromised when undetected problems deteriorate, leading to damage. At some point, this will cost you a lot to repair. Can’t I just pay for maintenance when I need it? Sure, but keep in mind that you’ll have to closely monitor your compressor’s service requirements and order each service separately. A slow procurement process can lead to a delayed service which potentially means an increase in overall costs. What are the risks of delaying my maintenance checks? Most parts within your compressed air system have a specified lifespan. Failure to replace them on time can impact your compressor’s overall efficiency and reliability. Not only does this increase ongoing production costs but also the chance of a breakdown occurring which can have an even bigger impact on profitability. How do energy costs affect my budget? The biggest part of the total cost of ownership for compressed air equipment is energy consumption. If you fail to properly maintain your air compressor system, pressure drops may occur, decreasing the system’s efficiency. During an average compressor’s lifetime of around 10 years, the cost of compressed air is roughly divided up as 73% energy costs with the remaining 27% divided between capital costs, installation and maintenance. In reality, producing 1 kW of compressed air requires 8 kW of electricity. So, if you’re not evaluating the energy performance of your system, you are potentially converting your money into thin air. How often should my receiver be inspected? Under the Occupational Safety and Health Regulations 1996 requirements and AS/NZS 3788:2006, routine biennial inspections of pressure vessels is mandatory. Pressure vessels used in the workplace present a lot of potential dangers when not properly maintained which can cause damage to property, injury and even death. This is why it’s essential to properly install and service receivers and ensure that all of your equipment complies with the relevant AS standards and Worksafe WA regulations. Do I have to register my receiver? 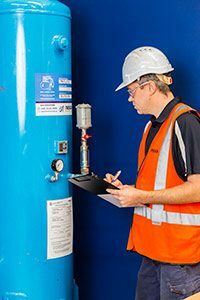 As per the Occupational Safety and Health Regulations 1996 along with AS/NZS 3788:2006, registration of pressure vessels is mandatory in order to assess safety and to detect any dangerous deterioration. Interested in learning more about Nessco Pressure Systems servicing and maintenance capabilities? Then get in contact today. A lot of careful planning goes into the decision to purchase an air compressor system. Buyers have to contemplate a variety of factors including the amount of air pressure needed, what type of system fits their needs and how much they are able to invest in a system. If you don’t have the knowledge and experience that Nessco Pressure Systems has when choosing the right system, mistakes can be made when selecting what to buy which can cost you in the long run. Let us help you out by pointing out some of the things to look out for when selecting your compressor system. Deciding on the correct size of compressor is key to the efficiency of your business. The wrong size can lead to problems with production and wasted energy which can increase overall costs. It’s also wise to plan ahead and think what may be your needs in the future. One of the key determinants to selecting size is the amount of pressure required. Your air compressor has to be able to provide enough air pressure so that you are able to complete the task at hand. Anything less will not work, rendering your system useless. This is why it’s important to know the pressure that is required beforehand so that you are able to choose a powerful enough compressor. Another important factor to consider is the correct air flow needed for the compressor. To put it simply, flow is the ability of the compressor to perform a task within a given time period. The amount of flow needed is determined by the length of time required to complete the task. If your flow isn’t sufficient enough, your compressor will need to build up pressure inside its reserve tank which suggests that the compressor you’ve chosen might be undersize. Again it’s important to know your requirements before making a choice. One of the best ways to figure out the correct flow needed is to perform a compressed air audit which can be conducted by our knowledgeable NPS staff. It’s also important to consider what your air usage might be like in the future when making your decision. While your current air pressure needs might be small, a company that plans ahead and selects an air compressor that will account for the growth of their business can save themselves a considerable amount by not having to purchase subsequent compressors systems. The type of compressor your business needs is another factor you need to consider at decision time. Two of the more popular options available are piston and rotary screw compressors. The piston compressor is one of the most economical options available. This is a small and robust air compressor that is often used in small workshops, tire shops or manufacturing facilities. One of the highlights of the piston compressor is that they are relatively easy to maintain and usually require minimum investment however this doesn’t mean you should buy one this instant! Piston compressors are designed for intermittent use which means it can only work about 50-60% of their duty cycle. These units also need time to cool off between their cycles otherwise they will overheat and fail. Another factor to consider is that piston compressors can be extremely loud when operating, so you may want to take into account whether any employees will be working close by. The rotary screw compressor is designed for operations that require a constant compressed air supply. While piston compressors may only need to be in use for 50% of their duty cycle, rotary screw compressors may be used up to 100% of their duty cycle and are generally built to have long, reliable lifespans. The amount of popularity for screw compressors means there are plenty of options available which suit a range of budgets and needs. So these are a few factors to consider when choosing which air compressor system is right for you. If you’re looking for more advice or information about which system would be right for you, you can get in contact with one our friendly staff who are able to use their extensive knowledge and experience to find the solution for you. If you’re looking for more information, get in contact with Nessco Pressure Systems today.